The sauce is made with simple ingredients - chopped tomatoes, garlic, lemon and parsley, with a few ingredients you may not expect - capers, raisins and ground cumin. The flavors come together beautifully, and the sauce can be simmering slowly while you marinate the fish in the vinegar and then give it a quick broil. If you are good at multi-tasking, this dish could be made even faster than one hour, but it is more realistic to plan for at least one hour. Just remember to not let the fish marinate in the vinegar any longer than 30 minutes, otherwise you won't taste the fishiness, but you will taste vinegar! This is a blend of pretty much everything in your kitchen, but it works. From real mediterranean flavors like olive oil and garlic to eastern flavors like ground cumin and golden raisins to other flavors like butter and parmesan cheese to give it a little savory bite of flavor. Marinate the fish: In a deep dish, put the fish in and then pour enough vinegar over to fully immerse the fish. Let the fish sit and marinate in the vinegar for 30 minutes. 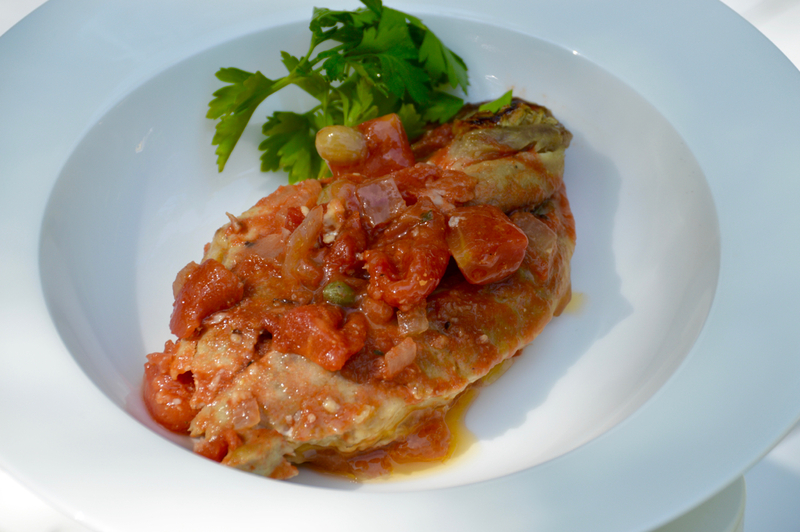 While the fish marinates, prepare the tomato sauce. In a medium saucepan, heat olive oil over medium-high heat until oil is shimmering. Add onions, cook until it begins to turn gold in color, tossing regularly. Add tomatoes, garlic, spices, pinch of salt (not too much) and pepper, capers, and raisins. Bring to a boil, then turn heat down to medium-low and let simmer for 15 minutes or so. Once fish has marinated, remove the fish from the vinegar and discard the vinegar. Set the broiler to high and make sure the rack is in the middle of the oven. Broil the fish for about 5 minutes, or until the fish is almost all the way cooked through. Remove the fish from the oven. In a large saute pan, heat the butter over medium-high. Once melted, place fish down into the pan and season with a little salt, pepper and a sprinkle of parmesan cheese. Let the fish simmer for about 2-3 minutes each side, repeating the salt, pepper and cheese on the other side. Pour lemon juice into the sauce, stir and taste for more salt if needed. Pour the sauce over the fish into the saute pan, letting it come to a simmer and allowing the flavors to come together (about 5 minutes). Serve immediately with extra sauce spooned over the top of the fish.